"Nature lovers will relish this insightful compendium, chock-full of touching stories about natural history and animal folklore." "Thorough, interesting, informative, a great reference book for anyone who works with, or wishes to work with, animals, either as totems, spirit guides, or for divination. Highly recommended!" "...[the] author's sense of wonder is infectious, and the knowledge he has gained first-hand is well worth learning." Ted Andrew's many gifts included clairvoyancy, aura interpretation, past-life analysis, dreams interpretation, numerology, and Tarot. 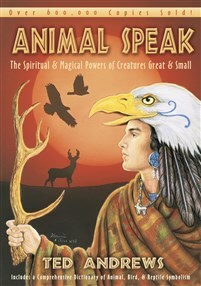 He wrote many books on these subjects, but is best known for his work with animal mysticism and for his bestselling Animal Speak: The Spiritual & Magical Powers of Creatures Great & Small. Certified in basic hypnosis and acupressure, Andrews was also involved in the study and use of herbs as an alternative path in health care, focusing strongly on esoteric forms of healing with sound, music, and voice. In addition to his interest in metaphysics, Ted was a trained pianist and often used the Celtic harp, bamboo flute, shaman rattles, Tibetan bells, Tibetan Singing Bowl, and quartz crystal bowls to create individual healing therapies and induce higher states of consciousness. Ted Andrews is the author of The Healer's Manual; Animal-Speak, How to See & Read the Aura; Enchantment of the Faerie Realm; Crystal Balls & Crystal Bowls; How to Uncover Your Past Lives; How to Heal with Color; Sacred Sounds; Simplified Qabala Magic; and many other New Age titles. He passed away on October 24, 2009.